Learn about the XML policy. You can use the XML policy to write or import XML that will perform a specific function or functions. If a policy is imported with a WSDL document, and it holds an assertion that is not known within the product and therefore does not have an associated user interface, it is treated as an XML policy. This policy supports standard XML as defined in the XML 1.0 specification. The default encoding type supported by this function is: <?xml version="1.0" encoding="UTF-8"?>. XML must be well-formed, following the requirements stated in the XML 1.0 specification. When a policy is attached to a service, the Policy Element (wsp:Policy) is added to the WSDL. Therefore, the XML provided in this policy must contain only the Policy Assertion XML. Find the policy on the list and click to go to the pane for the XML policy. In the second section, click Modify. The Modify XML Policy page opens, as shown below. When done, click Apply to save and close the policy definition. An XML policy must include a policy assertion. In this example, an Authentication Policy is used to illustrate the Policy Element and Policy Assertion that represent the configuration of the policy. Policy Manager adds the Policy element (line 01, wsp:Policy). 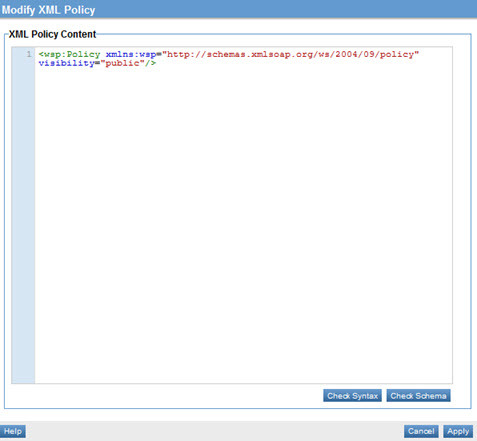 The Policy Assertion XML (lines 2-5) is added to the policy using the Modify XML Policy page.